OH, YUMMMMMM!!! 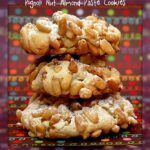 Almond paste is magical in these cookies! 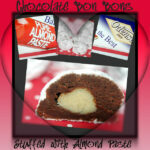 A must try if you’re an almond paste fan like I am! 1. Preheat oven to 350 degrees F. Beat the butter and sugars. Add the almond paste until incorporated. Add eggs and vanilla. 2. 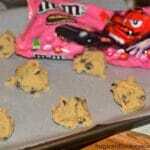 Add dry ingredients. Fold in chips. Chill dough. 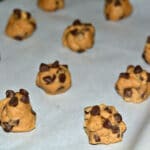 Scoop onto parchment lined sheets and bake for 10-12 minutes or until edges lightly brown. Immediately press in lots of chips!!! Cool! Chocolate chip cookies are my favorite. This is a great idea. I have to try this. Thanks for the clever idea. I made these cookies for a group meeting. They went so fast and everyone wanted the recipe. I like the idea of adding “more” chips as soon as they come out of the oven…Good thinking! as if you add “too many chips into the bater…Well, theres not much room left “for the cookie part!